A French icon in military watchmaking. 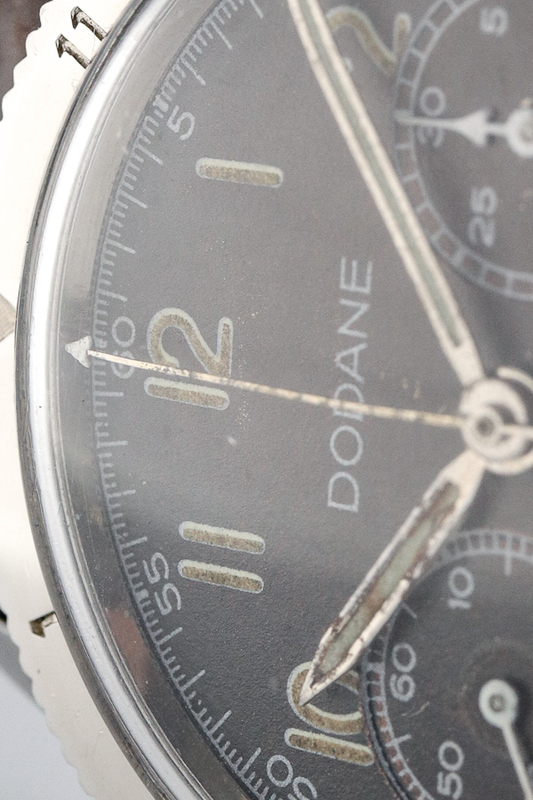 Not everybody will have heard of the French watch manufacturer Dodane even though it was born in 1857. They don’t have a particularly big collection nor a famous name because they don’t have pioneering accomplishments in watchmaking history, but it’s still very cool and reliable, and this watch in specific is even quite collectable. The French Army had need for new military watches in the 1950s for both the Navy and Airforce. In the past brands like Breguet, Airain and Vixa manufactured watches for the French army. However, in 1956 the French army increased the standards for the military watches. 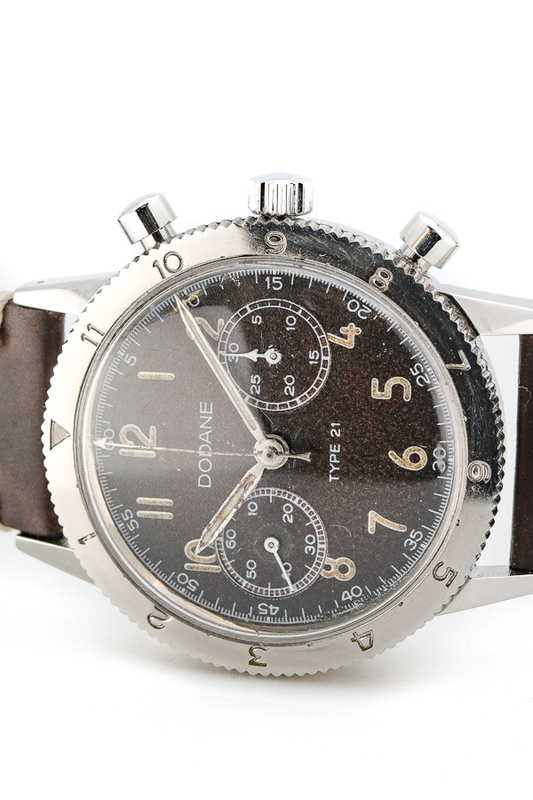 The military chronographs had to become more precise, reliable and it needed a ‘flyback’ function. This was an opportunity and only Dodane took it. Apart from the cool story, this watch was actually used for at least 6 years by the French army. In the case back there are four numbers engraved. One of them is the case number, the other three refer to the guarantee and precision of the watch. Three different and exact dates are engraved in the case back, one from 1969, one from 1971 and another from 1974, together with the letters ‘FG’. These two letters FG stand for ‘Fin the Guarantee’. 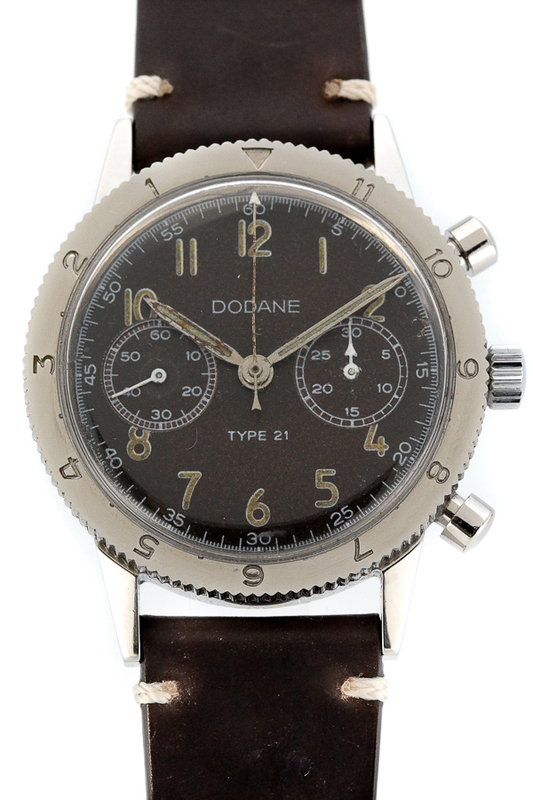 Dodane serviced the watches for the Army and engraved each watch with their expiration date when it comes to meeting the required standards the Army had. 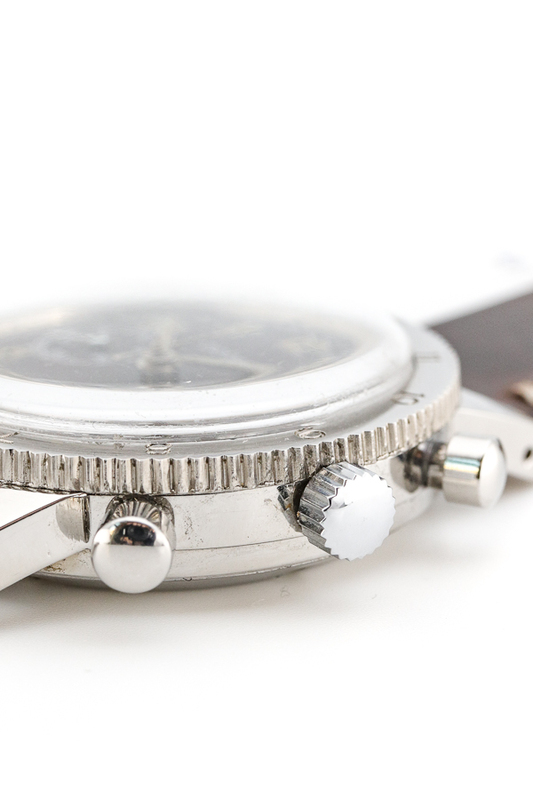 Apart from its history, this watch is still very cool and functional. 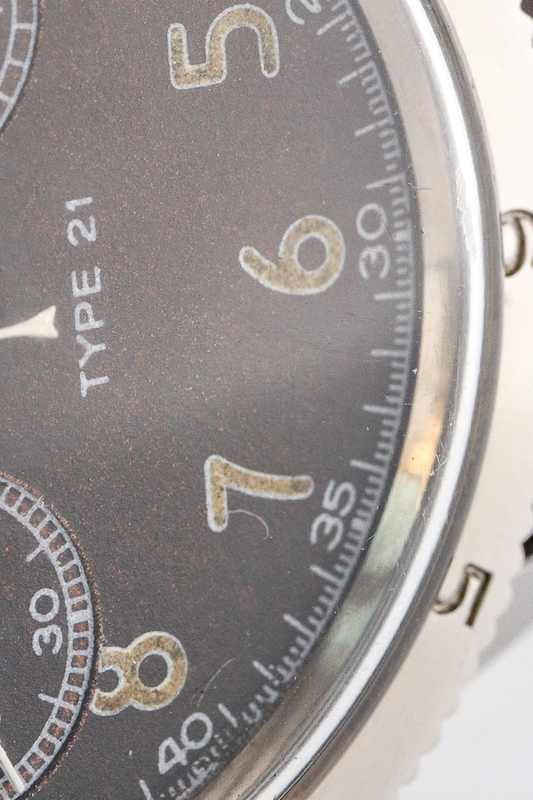 The tritium indexes are very well legible and intact, they did get a nice patina over time giving this watch the appropriate vintage character. The duo-register chronograph works perfectly, and continuous running with no delay when flying it back with the bottom pusher. 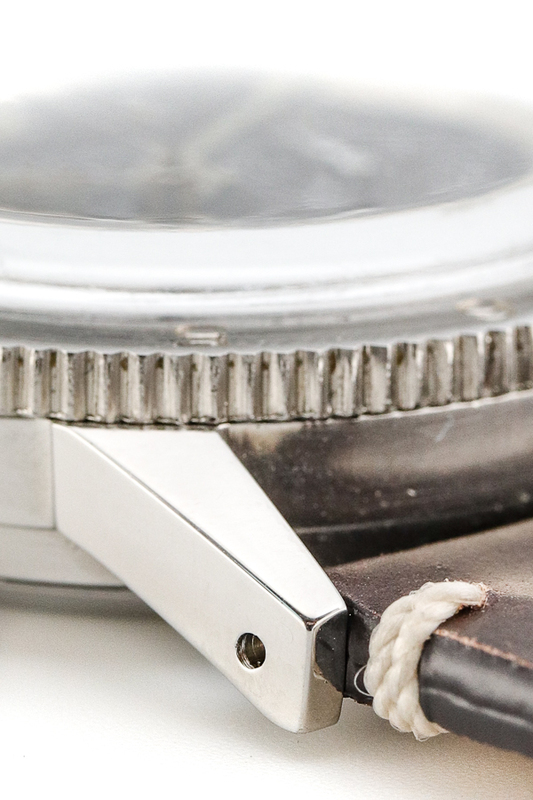 Maybe the most charming characteristic of this watch is its tropical dial. The rusty-brown colour on the previously matte black dial confirms this watch has been out there a lot and it just looks warm and unique. The watch case of this Dodane is close to perfection, no big dents or wear even though it was used by the Army. Come and check this real piece of vintage out in our store. We are located in the Reestraat, Amsterdam.